Is there a way to run a script on shutdown, after the file system is remounted as read-only? I've a raspberry pi connected to a wireless socket, which I can control via a sender and a script. I want to power off that socket (powering off the raspberry) on shutdown, after the file system is mounted read-only. The script /test does output the current mounts. When it's run on shutdown, it states read/write for the root file system and not read-only as expected. I found a reliable solution: Just put the script in /usr/lib/systemd/system-shutdown/. Regarding your original script, it's usually ran before halt.target (note you didn't order it before halt.target) - and filesystems are never remounted ro at that point. 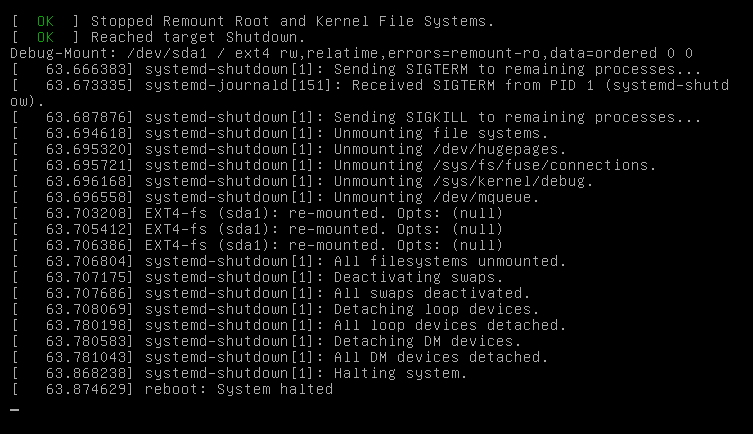 systemd-shutdown (to which systemd execs at the very end - after reaching halt.target), kills stuff (possibly along with your not-ordered script =) ), runs final umount/swapoff/losetup, remounts ro what couldn't be umounted, then runs in parallel stuff from system-shutdown directory, then tries to pivot_root() into /run/initrams if shutdown exists there (and if it doesn't or pivot fails, proceeds with halt). Not the answer you're looking for? Browse other questions tagged systemd shutdown init-script readonly unmounting or ask your own question.